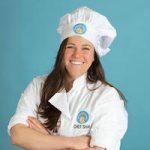 Inspired by her passion for food and education, chef and teacher Shai Mandel founded Rooks to Cooks with the goal of teaching kids cooking, life skills, and important lessons they can use both in and out of the kitchen. Rooks to Cooks offers unique and specialized cooking education to children in the greater Toronto area. Chef Mandel’s student-centered summer camps, after-school programs, and workshops emphasize empowerment, healthy eating, and fun.